The start/finish line has moved. (It will be about 1/4 mile to the west (still on Eagle Bluff property) where you will have a full view of the new bridge and our runners crossing, and they will have a view of the finish line. 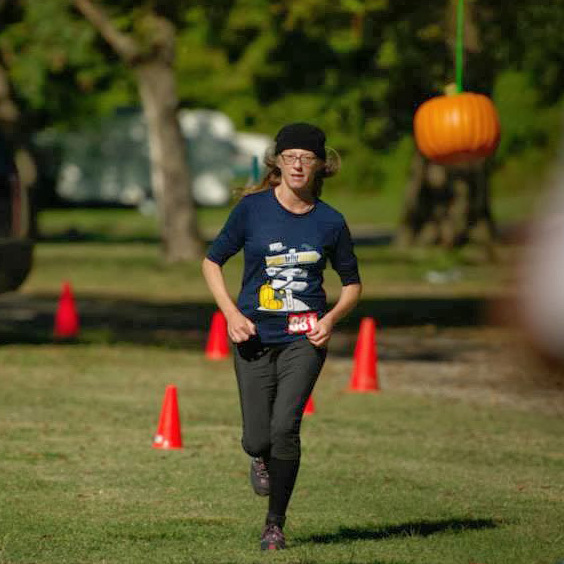 TZ Trail Runs and Tulsa Area Trail and Ultra Runners want your experience at the Pumpkin Holler Hunnerd to be the best possible. For your safety, the safety of others and to ensure we can continue this event we have a few rules to follow. Rule #1 - Leave No Trash On The Course. If you bring it in, you must take it out. There are trash cans at every aid station. Anyone caught littering will be disqualified. Anyone. This entire course is run on county roads along the banks of the scenic Illinois River and the perimeter of the Nickel Preserve and we do not want to jeopardize our ability to utilize this land. Littering includes gell tear-off tabs, banana peels, candy wrappers and other trash (organic or not). Rule #2 - Appreciate the volunteers. Many volunteers were up before you preparing for the day. Many will stay out longer cleaning up. Most will do both. Rude or disrespectful behavior towards a volunteer, staff or race director will get you disqualified. Rule #3 – No short-cuts. If you find yourself off course return to the last location you know you were on the course and continue on. Failure to do so will result in disqualification. Rule #4 - Have fun! Race bib/number must be worn on the runner’s front and must be visible at all times. 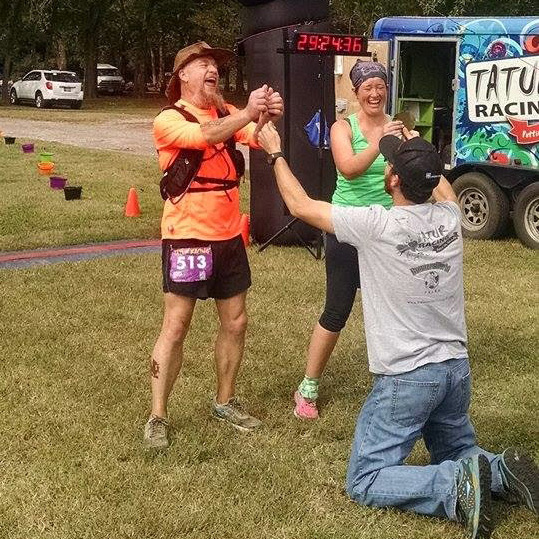 Runners are responsible for making sure their number is recorded at each aid station. From dusk to dawn, runners and pacers must wear a headlamp and reflective gear or a flasher on his/her back. 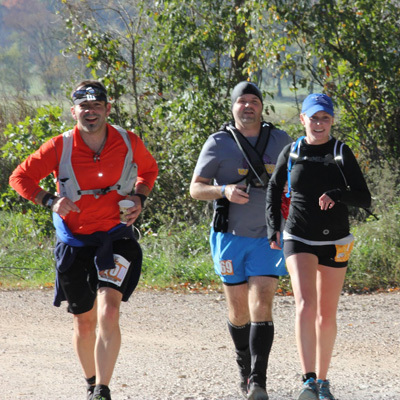 Pacers are allowed for only 100 mile and 100K runners after the first 50K loop. Pacers are allowed on first loop if runner is over 60. Runners are responsible for the actions of their pacers/crews and must observe/convey the Pacer Rules and Crew Rules to their team. The number of pacers is not limited, but the runner may be accompanied by only one pacer at a time. Runners receiving aid from crews outside of the designated crew access points are subject to disqualification. Runners accepting a ride for any reason are deemed out of the race and may not re-enter the course. Stashing supplies along the course is forbidden. Any runner dropping out must immediately notify the nearest aid station captain or race management at the start/finish area. Medical personnel, race director, co-race directors and aid station captains have the right to pull a runner if they feel a runner may be a danger to himself/herself. All runners will abide by the directions of race management. Violations of any rule will be grounds for disqualification. All decisions of race management are final. Drop bags must be labeled with your name, bib number, race distance and the aid station destination. Securely affix the label to the drop bag in an easily visible location. Omissions will prevent your bag from reaching the desired destination. Deposit drop bags near the Start/Finish 45 minutes before the race start time. Bags should be left next to the corresponding aid station sign for delivery to the noted aid stations. Drop bags should be a waterproof bag or small box type container. Trash bags, heavy duty plastic bags, recycled grocery tote bags, gym bags, sport bags, small ice chests, Tupperware or Rubbermaid containers all work well. Generally paper bags or cardboard boxes are not good materials for drop bags. Drop Bag Retrieval - Please remember to take your drop bags home. We totally understand that everyone is tired and wants to head home after running. However, runners nor their crew are permitted to drive on the course to pick up their drop bags. 100K and 50K runners who want to grab their drop bags at the conclusion of his/her race can follow the crew map directions and drive the paved roads to the aid stations. Otherwise, after the last 100 mile runners leave the drop bag aid stations, the drop bags will be delivered to the start/finish area.